In the aftermath of the mass shooting at Marjory Stoneman Douglas High School in Parkland, Florida, where just over a month ago 17 lives were lost, student organizers and supporters have taken to the streets to demonstrate for school safety and gun control in the March for Our Lives. Hundreds of thousands of demonstrators showed up to march in more than 800 protests planned in all 50 states and around the globe on every continent except for Antarctica. The main event took place in Washington, D.C., where throngs of people showed up to support the cause and hear student activists from Parkland, Florida, as well as celebrity guests, speak out about gun control reform. Seventeen-year-old student Emma Gonzalez, who has become a prominent face of this movement, led the crowd in six minutes and 20 seconds of silence—the same amount of time it took an armed former student to kill 17 people at her high school. Other speakers and performers included Martin Luther King Jr.'s granddaughter, Yolanda Renee King, Miley Cyrus, and Paul McCartney, The Guardian reports. Survivors of the Parkland shooting and students across the country have called for stricter gun control laws both on and off social media, creating an unprecedented movement in the wake of what has proved to be one of the most pivotal mass shootings in America's history. The mission of the latest show of activism is "to demand that a comprehensive and effective bill be immediately brought before Congress to address these gun issues," the official march website reads. 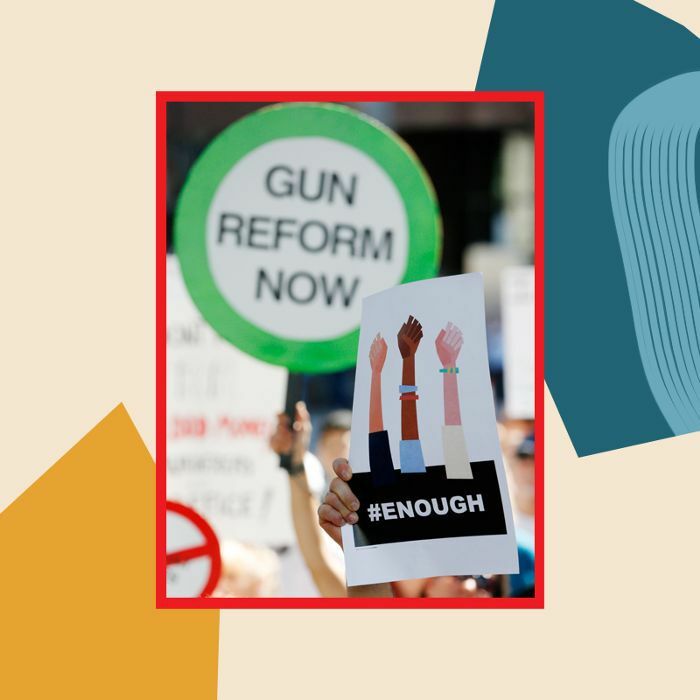 Earlier this month, a #NationalSchoolWalkout prompted students, teachers, school administrators, parents, and allies to stage walkouts across the country lasting 17 minutes, one minute for each person who was killed in the Parkland shooting. With support from politicians to celebrities, it seems this growing movement will not slow down anytime soon. The students of Parkland, Florida, have reignited a hope in so many people that change is possible, and like so many political and social revolutions before them, it's starting with young people. For more coverage of this historic event, head to The Guardian where journalism students from Marjory Stoneman Douglas High School have taken over the website as guest editors. Take a look at some of the day's most powerful images below.